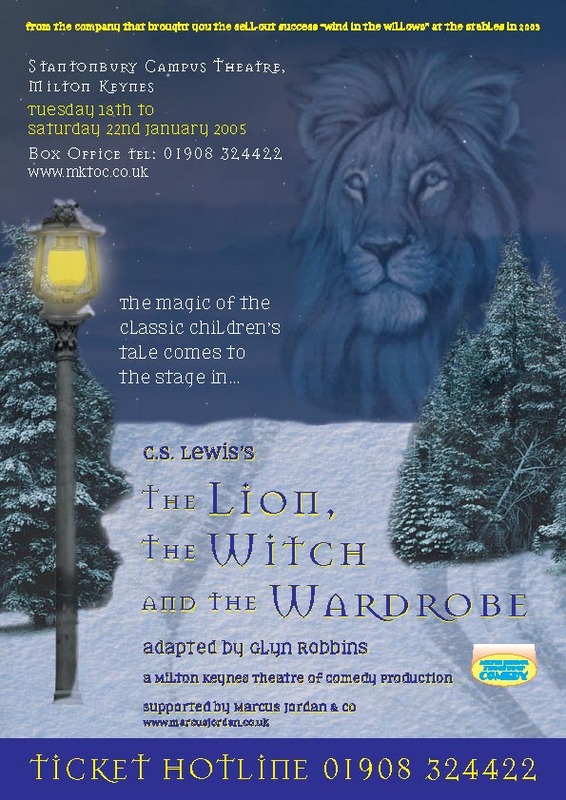 Travel to the mystical land of Narnia with the four children Peter, Susan, Edmund and Lucy. Enter a world where fauns frolic, trees talk and the civilization is remarkably civilized except for the evil White Witch, who will stop at nothing short of total conquest! Surely Aslan the great Lion will vanquish this diabolical creature… won’t he? But why is his return taking so long? And will his power be enough to overcome her dark treachery? This delightful adaptation of C. S. Lewis’s well-loved tale of good and evil is a delight for the whole family. Production generously sponsored by Marcus Jordan & Co (Olney). The understudies for Lucy, Edmund and Susan, played the roles in the matinee performance on Saturday 24th January 2005.